Blue and green furniture and finishes were chosen to evoke the Mediterranean Sea at this Israeli restaurant in Manhattan's Nolita neighbourhood. 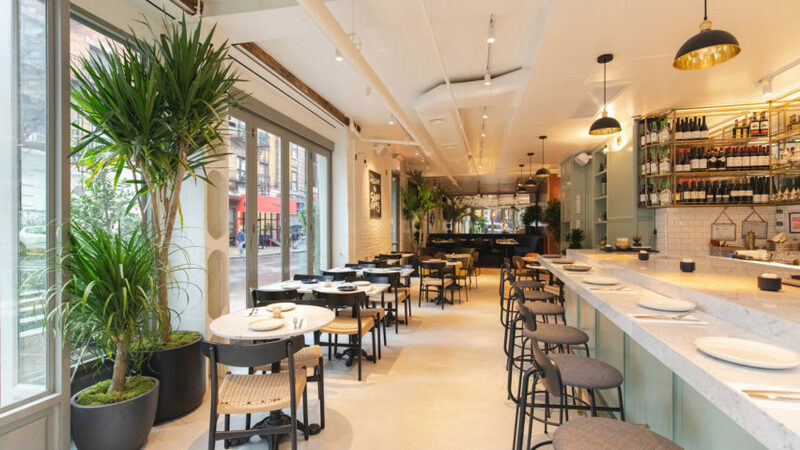 Shoo Shoo, on the corner of Broome and Mott streets, was opened this month by restauranteurs Shimon Maman, Albert Bitton and Sharon Hassan. "contemporary take on Mediterranean cuisine" served there. "Channeling the energy of Tel Aviv's bohemian cafe culture through a New York lens, the restaurant was designed to encourage the simple, timeless act of bringing people together around a common table," said a statement from the owners. A pale shade of blue-green covers the majority of the vertical surfaces on one side of the long, narrow space, as well as the frames of large windows on the other. Whitewashed brick and white subway tiles are used as a neutral backdrop, along with the ceiling and floors. Upon entering, diners arrive at a bar topped with Carrera marble, which is accompanied by a row of minimal Afteroom stools by Danish brand Menu. The rest of the 54-seat restaurant is occupied by lower tables for groups of various sizes. Towards the back, a slightly raised area designed to resemble "intimate French salons of the 18th century" is installed with deep blue, crushed velvet banquettes. This more cosy dining space is flanked by dark walnut across one wall and vintage mirrors above the built-in seating. "An eclectic mix of art-deco, Danish, and nouveau touches can also be found throughout the restaurant," said the Shoo Shoo team. Guri's previous projects include a cafe decorated with pale pink and mismatched marble in a Tel Aviv shopping centre. Meanwhile, other recent colour-themed additions to New York's food scene include a mint-green Chinese restaurant in Greenwich Village, a blue-toned French bistro atop a Financial District skyscraper, and a black-and-white cafe inside a design store at South Street Seaport. Photography is by Front of House.